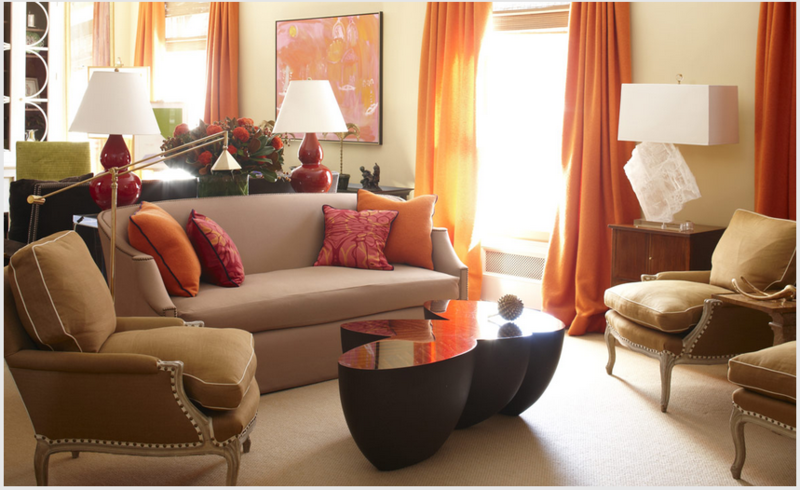 Amanda Nisbet Design & Color Power! Amanda Nisbet is an interior design wizard and color master, effortlessly mixing deep hues and textures to create rooms with emotional presence. Today’s interior inspiration is a walk through the delicious color of Amanda Nisbet’s palette There is so much to learn about design from her work! Maybe you can use some rich yellow on your curtains or walls? 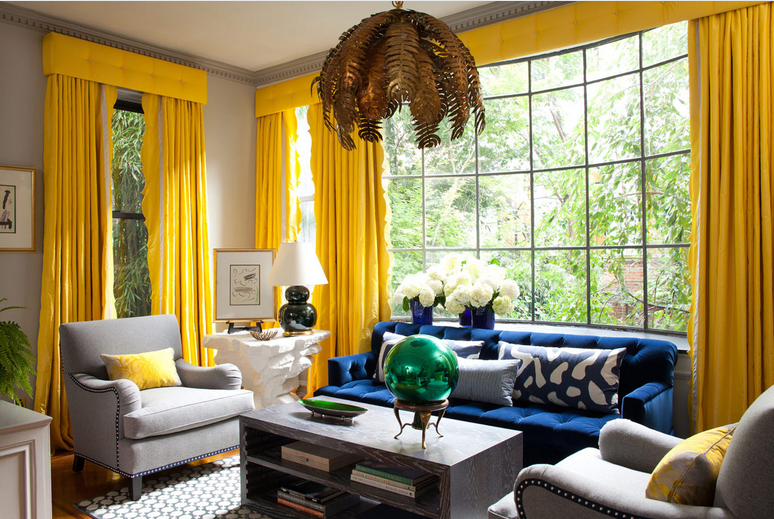 I love how she uses golden yellow as a neutral, using it as a sun-shining backdrop in rooms with ease. I grew up with copious amounts of golden yellow in my home, and it really is more neutral than, say, brown which is hard to bear in large amounts without a skilled hand. My biggest lesson: you have to fully commit to a color or a piece of furniture and simplify the details around it. If you are going big, go very big. If you are going saturated in color, dive into the deep end. The maximal impact of these spaces comes from the scale and emotive power of her choices. 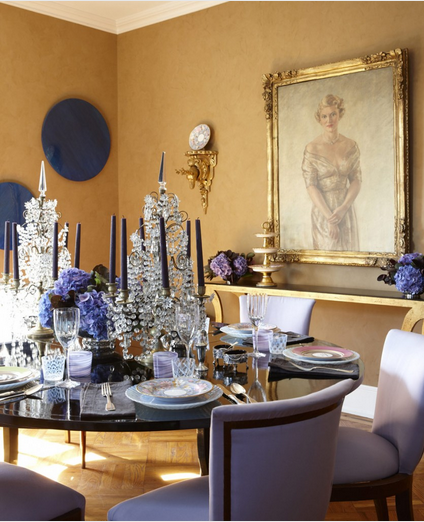 This royal blue room emanates utter confidence. Clever use of fabric on walls is another take-away from my hours bemused by Nisbet’s decor. Why not hang some curtain fabric along the wall for texture, life and a dose of the unexpected?! Creative green and spirited hot pinks make this an ultra-conversation-piece. Unusual color combinations- like concord grape and sand- create a memorable effect. Also, there can really never be enough crystal, ever! Its a very transcendent color coupling. 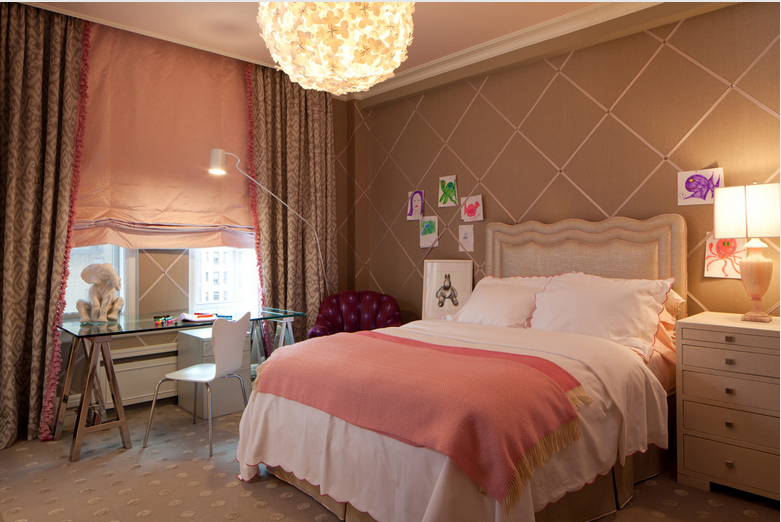 I included this delightful, neutral bedroom for the fabulous trick inherent in its design- the wall of ribbon crossed on the walls to create a picture-hanging device. How interactive, clever and grand-scale fun! Also, these are awesome tones of color to promote a restful sleep. Wow to the first and second is my favorite. I wish my living rome wash just like that ! I love Amanda design! It’s make my happy! Lovely!! Thanks Deares 4 sharing! Next post: Your Dreams Are Worth The Time!